Family Description: Annual or perennial herbs, or rarely woody, often with rhizomes or stolons. 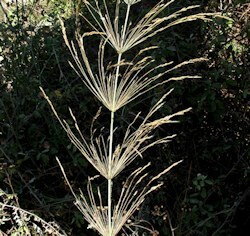 Flowering stems usually cylindrical, with hollow internodes and solid nodes, rarely solid throughout, with a meristem at the base of each internode. Leaves alternate, 2-ranked, consisting of sheath, ligule and lamina. Sheaths surrounding the stem, with free, overlapping, or connate margins, sometimes auriculate at the mouth. Ligule situated at the junction of sheath and lamina, usually membranous, sometimes a row of hairs or rarely absent. Lamina linear to filiform, rarely lanceolate to ovate, usually with more or less prominent, parallel ribs, usually constricted at the junction with the sheath, rarely shortly petiolate. Epidermis with long and short cells, some short cells usually filled with silica-bodies, others with corky walls; hairs of 2 kinds often present, macro-hairs which are stout, thick-walled, usually 1-celled, and micro-hairs which are microscopic and either slender or globose, usually 2-celled, with the distal cell thin walled. Flowers usually hermaphrodite, consisting of 1-3(-6) stamens and an ovary with usually 2 styles, the stamens subtended by (0-)2(-3) small, hyaline scales (lodicules), enclosed between usually 2 bract-like structures, the whole forming a floret. 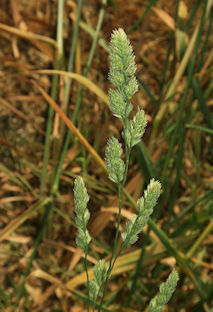 Florets 1-many, inserted alternately on 2 sides of a slender, jointed axis (rhachilla) and subtended by (0-)2(-3) bracts(glumes), the whole forming a spikelet. 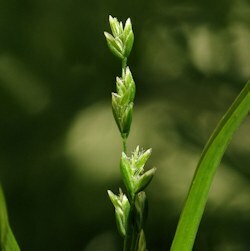 Lower bract of the floret (lemma) often with a dorsal or apical awn; upper bract (palea) usually membranous and 2-keeled, sometimes very small or absent. Lemma with a thickened, sometimes elongate and pungent base (callus). Ovary 1-locular, superior; ovule 1, attached on the adaxial side of the loculus, to a point or line visible in fruit as the hilum. 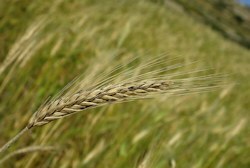 Fruit (grain) a caryopsis or rarely with a free, membranous pericarp.